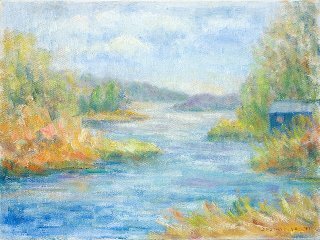 Lois had never considered painting until one day while using hypnosis, in a successful effort to control migraine headaches, she experienced a sudden desire to paint, and felt compelled to go into town and purchase art supplies. She produced a small floral painting and enjoyed the experience very much. Her husband Jay encouraged her to find a good teacher and study art seriously. 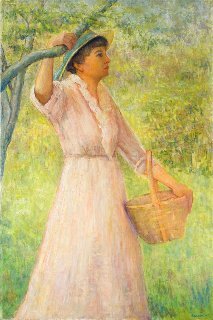 She began her studies with the very popular artist and teacher Robert Brackman at his summer school, The Madison Art School in Madison, CT where she studied for seven summers. During the first two years she also studied with Foster Caddell of Voluntown, CT, and credits him with teaching her the basics of painting. She continued her studies with Brackman at the Lyme Academy of Fine Art, where she was monitor of the Brackman classes. It was this experience that made her aware that she would enjoy teaching. Following the death of her dear friend and mentor Robert Brackman in July of 1980, some of his students began encouraging her to teach and thus continue the Brackman tradition. About two years later she did start teaching classes, which were attended primarily by former Brackman students. 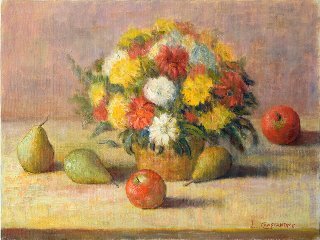 Lois encourages her students to work from life, in the impressionist style, and stresses the basics of composition, color and value. She currently teaches at her own art school, and continues to find great satisfaction in passing on the joy and fulfillment found in the art of painting. Lois was so focused on, and dedicated to, the type of work she had been enjoying for many years that when she was told by the very gifted clairvoyant master and intuitive teacher Kerrie O'Connor that her guides were suggesting she would be doing visionary art, Lois thought no more about it until almost a month later when a vision appeared as she opened her eyes to the morning light. She saw a beautiful lady dressed in white walking across her line of vision and knew instantly that she would paint her. The second image appeared the morning after the first one was completed and signed. That process continued until thirty- six paintings were finished. After an exhibition of these works was in progress during December 2007, the images continued coming, but in a random manner. They continue today and sometimes she is aware of two or three that are waiting to be painted. The creation of these images continues to bring a sense of being on a beautiful journey, with deep gratitude for being directed along the way. Through the years words have come to Lois in response to intense emotions. Since the words come to her in the same manner as the visionary paintings, she does not change or re-write them. Some short examples appear in these pages. A book containing 36 poems along with the first thirty-six paintings is available for purchase. 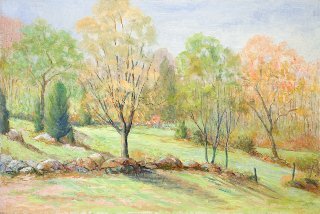 Lois is an artist member of the Salmagundi Club of New York which is the oldest professional art club in the United States. She is also a member of several other art organizations including the Mystic Museum of Art in her hometown of Mystic, CT. Her work is represented in national and international collections.